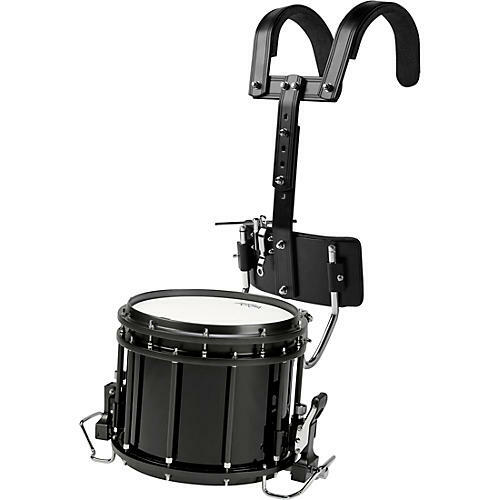 Sound Percussion Labs High Tension Marching Snare Drums are designed to fit the needs of any school function - from halftime shows to parades to pep bands and more. Designed to give an articulate modern snare sound, the SPL High Tension Snare Drums features an all-birch 7-ply shell is combined with high-tension tube lugs and aluminum alloy die-cast rims and edge ring. A forward throw-off and bracketed end allows for micro-tuning of each of the 14 synthetic gut snares. The entire throw-off is protected by stabilizer guards. Outfitted with Remo USA FALAMS heads and bottom snare offer the final touch ensuring a crisp articulate contemporary sound. Available in two sizes 13" x 11" and 14" x 12" either midnight black or pearl white finish. All SPL high-tension snare drums include a free t-style lightweight carrier at a value of $150 to $200. Sticks included.